I have not posted since November. The truth is that I started crunching numbers in order to formulate a true business plan and the outputs of those calculations did not look pretty. If all of my calculations are accurate (which is a big assumption), including pigs, cattle, laying hens, broiler chickens and apiary products, the first year would net $24258.85889 of income but this only considers direct costs of producing each animal while omitting general start up costs like fencing, water troughs, mineral feeders, plumbing, etc. Certainly not bad in of itself but it relies on a few assumptions, mainly that I will be able to sell each finished animal to 1-4 people as regulations require the processed meat to be sold as a full, half or quarter animal to a customer who must pick up the meat at the processing facility themselves. Being honest with myself: Marketing and sales are the most intimidating part of this farm venture so that assumption may be a dangerous one. I will go into more detail about all of my calculations soon, but the spreadsheets are quite messy and require either re-organizing, lots of explanations, or both. They will also be subject to change as I find errors, new information or updated information (ie: major shift in market prices of animals or hay). In the course of researching for then making all of these calculations, I discovered a two major things: Sustainable agriculture/permaculture is generally extremely exploitive of labor and that most small farm ventures operate at a loss or gross under $10,000 annually. To the latter point, that means the most farm ventures cannot be the sole income source of the operator. To the first point, I attempted to find a single example of a sustainable agriculture/permaculture business with open books that is successful without exploiting labor or relying on other income sources for its very existence including off-farm jobs or a reliance on speaking/book deals for financial success. Spoiler alert: I couldn’t find a single one. 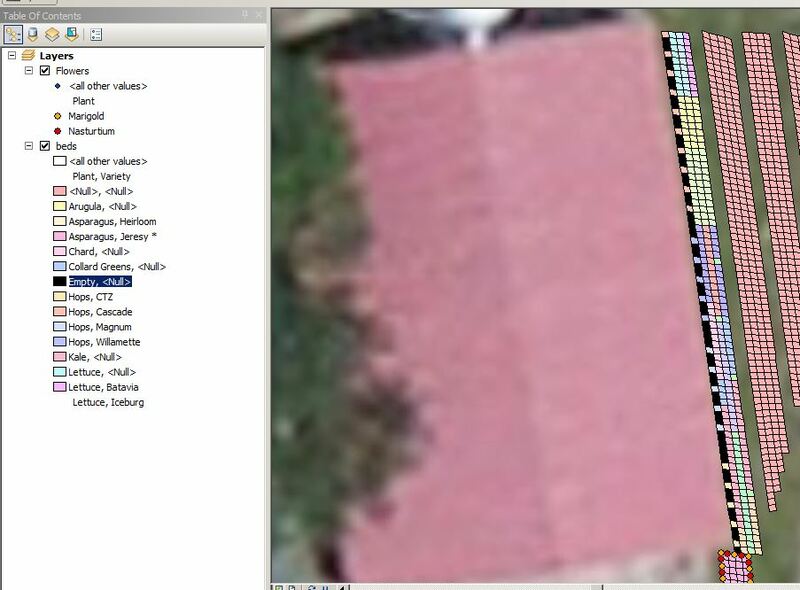 As to the exploitive labor practices of the industry, I did not have any objective data to back up my observations. So I decided to dig in a bit deeper and dust off my computer programming skills to collect data from sustainable agriculture internship postings. After analyzing the 135 most recent internship postings on the top sustainable agriculture job board, the results seem to back my observations. Now I just need to finish my report! Lastly, now with a more practical approach that came with all the revelations of the industry, I realized I could be doing all of this objective planning while working to maintain a source of personal income. When the business plan is done and I have concrete figures and goals, I can move into the farm operation full time with minimal gaps in personal cash flow. So I took a seasonal job while applying for position in the field in which I hold a degree. In conclusion, all my time since November has toward the seasonal job, applying and interviewing within the GIS field and working through the laborious but absolutely essential calculations involved in planning the farm business. There was simply no creative or analytical power left to maintain a good blog. From here on out, expect the normal blog content plus some boring, technical analysis of my calculations! Over the last few years, I’ve noticed some shifts in the operations of the nearby farms that produce crops for animal feeds here in the Shenandoah Valley of Virginia. Farmers are now practicing crop rotations in greater numbers than ever before; usually just corn and soybeans with grains mixed in occasionally. Using a leguminous crop like soybeans in the rotation harnesses their power of fixing nitrogen into the soil from the atmosphere replacing soil fertility lost to grain crops as well as cutting down on the need for synthetic nitrogen fertilizers with the included salts that damage soil life. Occasional inclusion of grains also plays into the second major improvement I’ve noticed: cover cropping. Most grains I see used here are planted immediately after the long crop harvest in the late summer or fall to provide a winter cover crop. Some are never even harvested and knowing before hand no harvest will take place allows a much broader choice in crop selection. Preventing exposure of bare soil to the forces of mother nature and weather keeps erosion at bay. If the grains grow to maturity, some fertility is taken from the soil but if the frost kills the crop, roots and plant residue returns that fertility. I’ve seen radishes, turnips and other non-grains planted instead of the conventional choice of winter grains. These brassicas amass nutrients only to be killed by frost releasing the mineralized (bioavailable) nutrients back into the soil as well as providing aeration by leaving voids where the roots or tubers compost. Another key change I’ve seen is the inclusion of no-till seed drills. While row cropping still requires herbicide application, the lack of tilling helps preserve fertility by reducing vaporization of nutrients. The benefits of not disturbing the microbial soil food web are likely lost to the burning salts in herbicides however. Yet a benefit is still seen with the seed drills: fall cover crops can be planted right into existing corn stubble or soybean residue. The former provides habitat for wildlife such as ground nesting birds and helps hold the soil in place as the cover crop gets established while the latter releases the mineralized nitrogen stored in the leguminous plant tissues. While not in my home area, on a trip to the beach in Delaware, I noticed some soybean farmers leaving uncultivated and wild strips of weeds and wildflowers through their fields. I can only assume this is to harbor wildlife like native pollinators to ensure a full seed set in the crop of beans. The next key step in more sustainable industrial fodder production is replacing the organic matter lost from soils to crop harvests removed from the farm for sale. No-till seed drilling is a step in this direction, but an inclusion of carbon matter if not compost would be ideal. Maybe it will take one of the big local names or the regional extension office to sway the masses. Confined animal rearing operations have also slowly began to show signs of improvement. I’m noticing more and more carbon stockpiles amassing near livestock barns and poultry houses. Massive and numerous piles of chipped wood are being dumped on these farms and judging by the continuous changing of the piles, farmers are using it for bedding and using it frequently. Also judging the varying quality and chiping size of these mulches, these farmers are sourcing the carbon for free or cheap as waste from local government agencies, power companies or tree service companies that have to clear brush or trees. Carbon in this bedding bonds to nutrients and ammonia from animals wastes reducing vaporization (air pollution) and leaching (groundwater pollution) then composts directly in the animal house (providing free winter heat!) or on fields adding both fertility and organic matter back to the local soils. This formation of a winter manure pack is an old practice that will the backbone of improving my soils. I could not be happier about this development! There are still a lot of farm practices I don’t agree with…especially in the industrial food production field. However it is vital to give credit where it it is due. Pitting industrial vs. sustainable agriculture is polarizing and damaging to both fields, not to mention building of animosity and the subsequent ability of human emotions to hinder progress. Remember, agriculture is historically slow to adapt to new practices so patience is vital in improving our overall food production systems. Very few of these practices would have been used even as little as a decade ago. Notice how the oldest practices of crop rotation and winter cover are the most widespread now even though the forces driving the practices have shifted from economic in gaining extra income from a winter grain crop to soil preservation. We can only improve from here and from the looks of it, conventional farms are already doing do! With incredibly well established crabgrass, killing it organically in order to create garden beds, tree planting sites, etc. seemed like quite a challenge. As time is on my side, I elected to lasagna garden! Existing plants (turf) are mowed down as low as possible. A biodegradable barrier is put down to smother out the existing turf. I used cardboard as businesses are happy to give it away but brown paper bags and even multiple layers of newspaper are adequate. 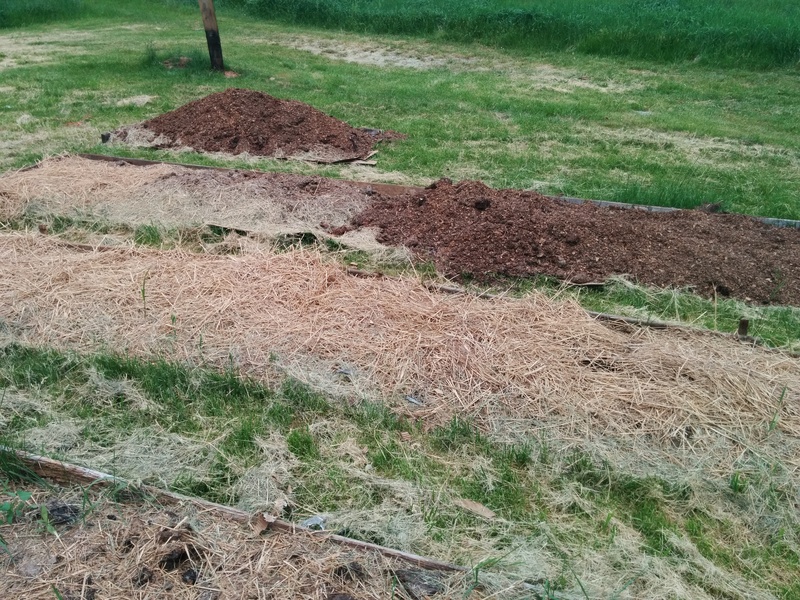 Compostable layers are laid down on top of the biodegradable barrier: Anything compostable: mixed nitrogen/carbon (green/brown) material, manure, mulch, etc. 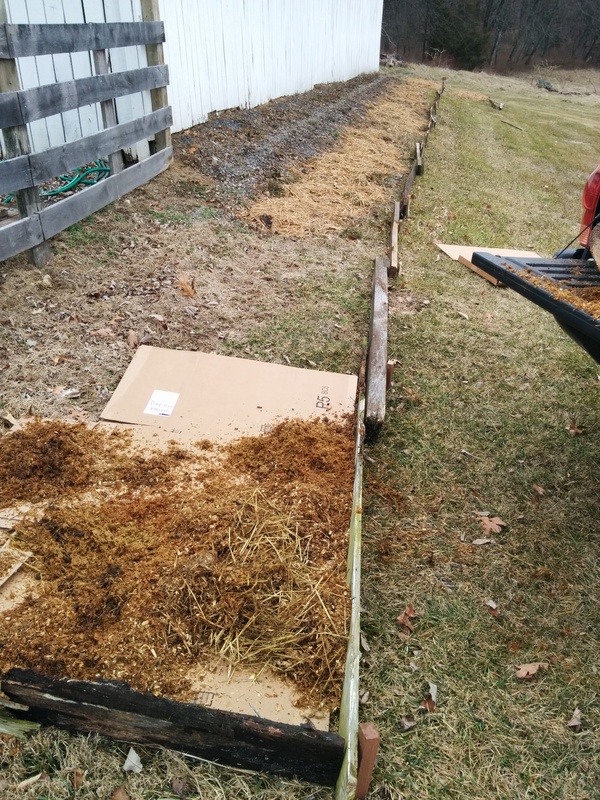 Working simultaneously with the composting materials from step 3, the layer in step two smothers out the established turf before composting both that now dead plant material and the barrier itself. 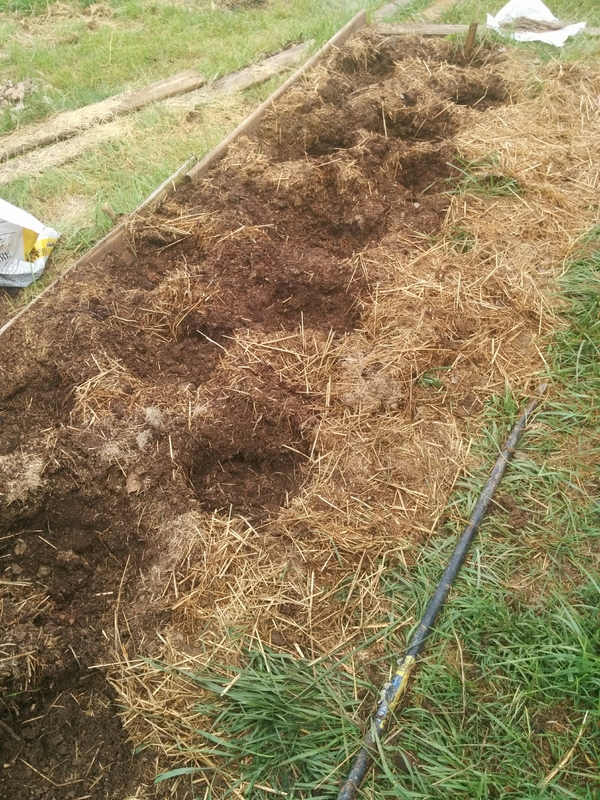 Between the organic matter used in this procedure and what is provided in the roots of the existing, smothered plants, the worm and microbe activity will be exceptionally high yielding quality soil for planting in the following season. Don’t forget to remove all tape, glue and staples from the cardboard. Also avoid glossy cardboard as it is coated in plastic. Here are some pictures of my process. Measuring 6 feet between beds (4 foot bed plus 2 foot aisle). These dimensions are simply my preference. Being 6’4″, there is nowhere I can’t easily reach in a 4 foot bed. Plan your garden beds to your preference! Fill with compostable layers (composting manure in my case) then mulch with whatever you have available to inhibit weed growth. 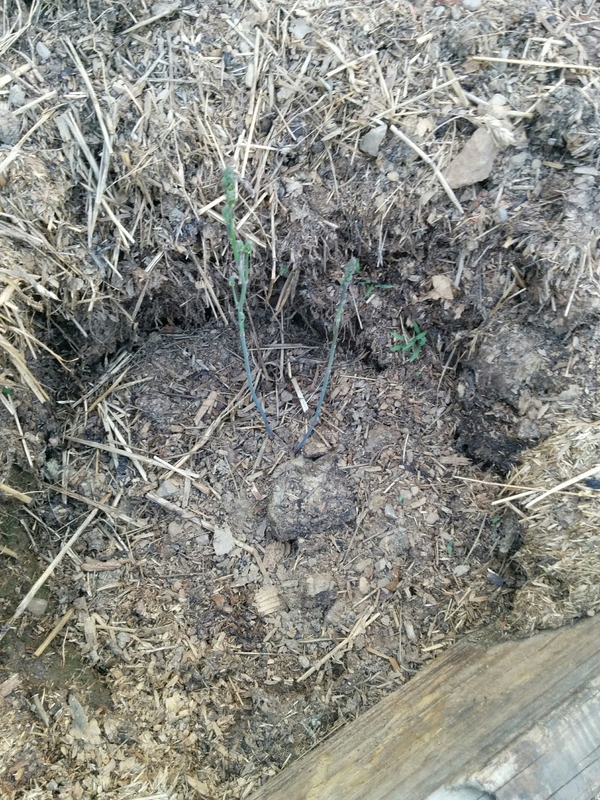 I also planted a cover crop of red clover as an experiment. 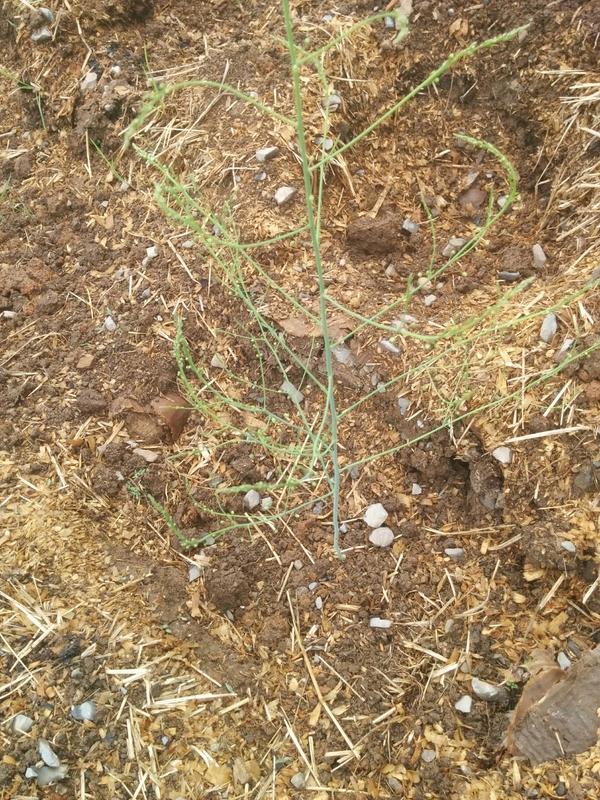 It seems to be germinating best where the compost is old or where some soil was mixed into the manure compost such as where I excavated to install root barriers in the middle of some garden beds. In retrospect, I can use old pictures to show the process from start to finish! The western most row of my garden will receive the most afternoon shade. As a result, the rest of the space not occupied by hops crowns will be planted with more shade tolerant plants. Chard If you grow chard mainly for its crisp stalks, you will need at least five hours of sun per day; if you grow it mainly for the tender baby leaves, three to four hours of sun per day will be enough. Expect chard grown in partial sade to be quite a bit smaller than that grown in full sun. Baby chard leaves are excellent cooked or served raw in salads. Another consideration is shade-tolerant currants. However I will reserve these to grow on the garden boundary fence that get the most shade from the tall silo. Peas are removed from consideration as they are already planned to be grown with corn and sunflowers in more sunny spots. Herbs deserve their own post so they will not be included here either. The shadiest row has an abundance of space so both salad greens and highly marketable plants can be included. Considering brassicas reported affinity for rhubarb means that mustard (for greens and seeds), collard greens and kale will be experimented with in the spring while cabbage, broccoli, brussel sprouts, cauliflower can be added in the fall. Additionally, columbine flowers and numerous salad greens will be planted adjacent to rhubarb and compared to those grown away from the plant. Therefore I will be filling out the shade row with Arugula, Chard, Kale, Lettuce, Mesclun (as a premixed salad that can be harvested directly as a mix), Mustard, and Spinach. Lettuce is really the only plant with varietal considerations so it will be planted in thirds: 1/3 will be iceberg (head) lettuce, 1/3 will be romaine, and 1/3 will be batavia. Considering aphids, companions will be planted along side the lettuce, but I have not yet determined which herbs or flowers to use. 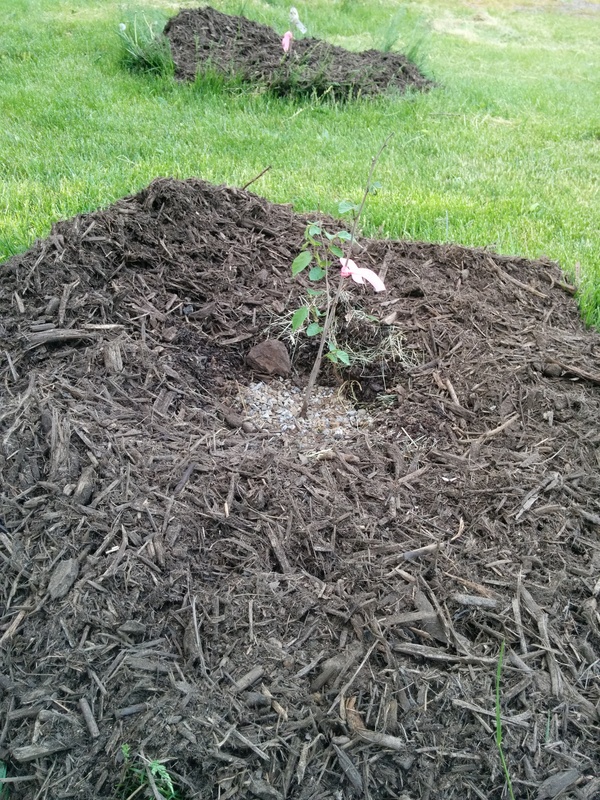 Quickly weighting the plants by preference gave me the final amount of 1 square foot spaces to dedicate to each plant. Spacing requirements were determined entirely from this PDF from Virginia Tech. Believe it or not, there are many places in the world where hay is still harvested by hand. Barring economic reasons, manual hay harvesting to provide winter fodder for animals is generally found in mountainous, rocky or uneven areas where machinery will break or simply cannot be run. As I will only be running 1-2 goats and 1-2 heads of cattle on the 10 acre pasture, there will be plenty of pasture that will grow into maturity and be wasted. Plus my hay requirements for 2-4 animals is very low. Remember from my early post on Grazing Sciences, that the most nutritious grasses are harvested before maturity and left with 3-4″ of photosynthetic material that creates the ebergy needed for grass to regenerate. 1. Swing the scythe that has been sharpened to a razor edge allowing the blade to do the work instead of force. 2. Re-sharpen scythe approximately every hour or every few rows of grass. While my uncle is a master, I am absolutely terrible at sharpening blades with a whetstone. I found this tool very useful in the kitchen on low end knives and honestly will try it as a scythe-sharpening shortcut (Amazon kitchen knife sharpener). For my nicer kitchen knives and hunting knives, I use this kit which is fantastic, but more work (Amazon Spider Co sharpening kit). 5. 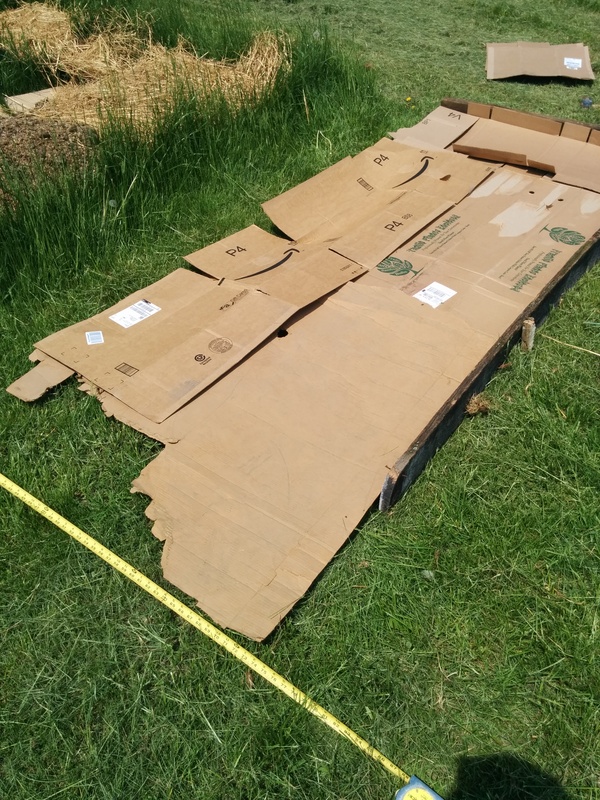 Once dry, bail the hay using a homemade piece of canvas (or similar material…maybe a tarp?) and tie it up. This is entirely optional! Alternatively just load the unbailed hay into its transportation method. 7. Unbail if bailed or spread and fluff to ensure complete drying of hay and prevent spoilage. Salt can be applied to any grass clumps that are still wet to discourage fermentation. Obviously I would use a salt meant for animal nutritional supplementation! Thats it! The stored hay can be fed in the winter as needed. There is an antique scythe already in my barn and I absolutely love manual labor as long as the tasks are varied. Harvesting hay manually limits the economic pit of buying single purpose equipment that dooms most failed farm operations. To put it bluntly, in the first year of starting my farm operation, I will have way more time than cashflow so the task would fit well as something productive with no extra equipment-requirements. It is also an homage to a pre-industrial way of life, provides a fun outdoor task and prevents me from buying or renting expensive equipment that would likely end up broken due to the uneven and rocky pasture. Most importantly, I will get to learn what is entailed by cutting, raking, bailing and storing hay without burning a single bit of petroleum. Assuming cattle or goat operation are expanded in the future that requires acquiring haymaking equipment, I will definitely have a deep appreciation of said equipment!